Although I had been in Penzance for three days I had not ventured far from the literary venues except to visit the odd pub for lunch so I decided that I must see more of the town. I wended my way down to the sea front and strolled along the promenade. 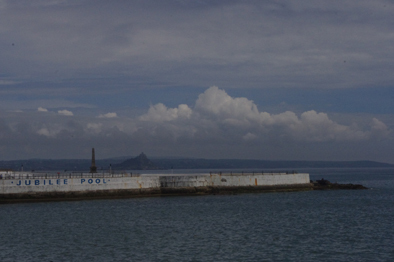 I saw the Jubilee Pool and St Michael’s Mount. The Jubilee Pool (or Lido) had been damaged by the winter storms and closed for repair. If the required money is not forth coming then it is in danger of closing. I stopped to buy lunch at the Pirates Fish and Chip Shop and ate it while sat on a bench on the promenade overlooking the sea. 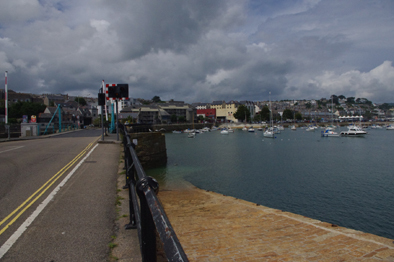 Then I strolled round the harbour before returning to the town centre where the festival venues are held. Penzance is not among the most picturesque of Cornish towns but I enjoyed what I saw. 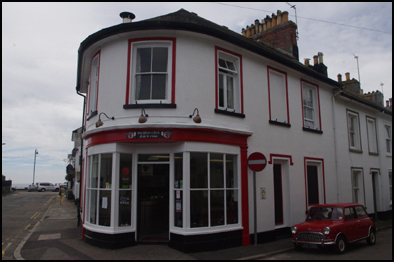 There are many intriguing shops and pubs to explore. 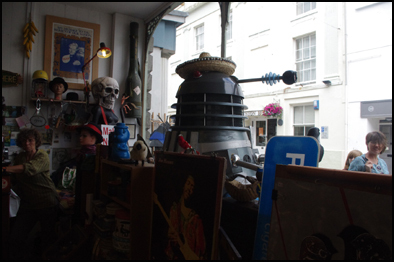 One shop was inhabited by a Darlek. I knew it must live there as a sign said that it was not for sale. 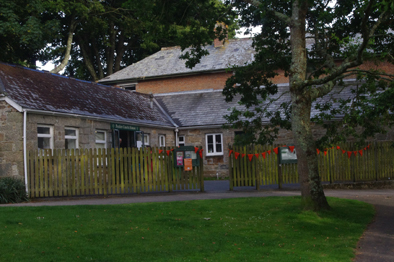 That afternoon I took part in an “open mic” poetry session at the Penlee Coach House run by the delightful Dina Dixon. A wide range of poems were read by both young and old. Adrian Rodda gave a rendition of a Cornish folk tale, ‘The Changeling of Chapel Carn Brea’. There were some excellent recitals from the works of Dylan Thomas. Two of the younger participants, Roxy from New York and Sebastian who was local, performed some thought provoking social commentary renditions. I read my Dulux colour poem and the Joe Thropp eulogy from “Cogrill’s Mill”. Both seemed to go down well but one lady in the audience thought that the Thropp poem might be directed at one of her forbears as Throp was her family name. I assured her that it was not as my Thropp was a totally fictitious character and his name had a different spelling anyway. But it was a close shave.